"Not too often do you hear 'fantastic' and 'Brussels sprouts' in the same sentence but this recipe is deserving of that. When I mentioned I was bringing Brussels sprouts to a holiday get together, my mom told me not to bother. After eating this dish, my family now requests I bring it to every get together!" I didn't find it rave worthy. It was a decent dish, but not more so than my usual roasting of the brussels sprouts with seasoning and olive oil. Very yummy! 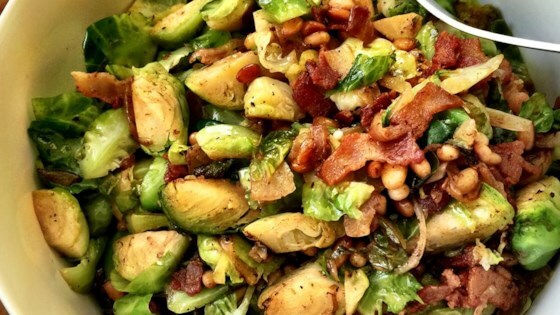 Didn't shred the sprouts, quartered instead... the bacon added a great flavor, and we loved it. Thanks for the recipe-- will definitely use again!